INTRODUCING – THE GREAT 3-IN-1 SPRING SHOW NEW FESTIVAL FOR THE NORTH WEST PROMISES MUSIC, FOOD & FAMILY FUN FOR MAY BANK HOLIDAY WEEKEND Saturday 27th To Monday 29th May 2017 At.. This May, Kirstie Allsopp And Her Team Of Experts Are Taking The Handmade Fair To Warwickshire! 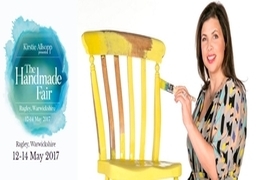 The Handmade Fair Ragley, Warwickshire 12-14 May 2017 This May, Kirstie Allsopp and her team of experts are taking The Handmade Fair to Warwickshire! Join Kirstie & co. for..